We will be off line for a bit. See you soon! Everyone, I wanted you to know that I have the bestest boyfriend in the world. Easy is my very handsome and thoughtful French boyfriend who sent me wonderful birthday gifts. First Lady put the package down so we could give it a good sniff. Being a good sister I let Phody sniff too. Then our Lady opened it and took the stuff away so she could get a freakin' picture (her priorities are wrong). Lady then let me have a little sniff time with the mouse toy. Easy sent it to keep our mice away! Because it is special I am not allowed to dead it. I do get very excited every time Lady turns it on. It makes beautiful music. Thank you to the most handsome and kind boyfriend! The treats are very tasty in my belly! 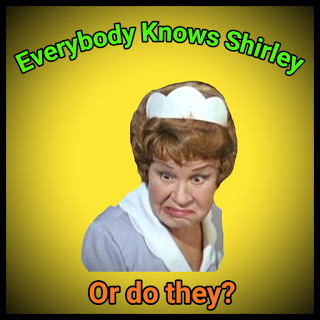 Blogville Mayorz Murphy and Stanley have declared this week: "Everybody Knows Shirley." This is the opportunity for us to introduce some of our friends who others may not know. We have decided we will share a few of our many (Lady says we read about 100 blogs - no wonder sometimes she has trouble keeping up) friends with you all today! Shirley everyone knows Hailey's cousin Ojo and beautiful Cobi from http://dogdoesntfetch.blogspot.ca. They live in beautiful British Columbia and have many, many adventures. Ojo does fetch, but Cobi does not. Shirley everyone knows the tribe over at http://www.ownedbyahusky.ca. 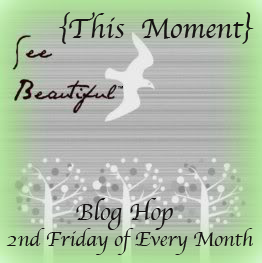 Another Canadian blog full of inspiration quotes, facts about huskies, and beautiful jewellery. Shirley everyone has been following the adventures of the yoga kittens (and the rest of the gang) over at http://atcad.blogspot.ca. Shirley everyone is as impressed as we are with the very talented Zoe and Phoenix at http://zoephee.blogspot.ca. Their new hug trick is one of the cutest things we have every seen. Shirley everyone who has read http://mygirlzgotpaws.blogspot.ca, wants to pack their bags and move to Hawaii like Gracie. 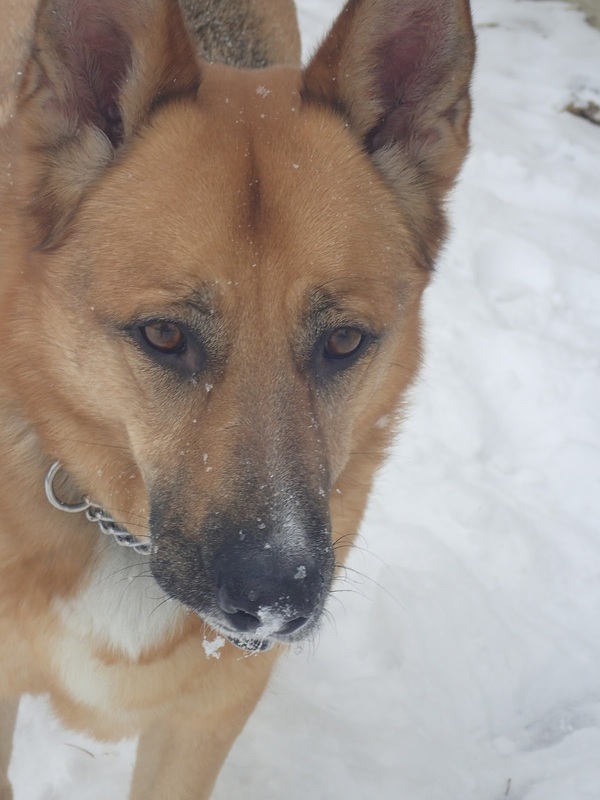 Shirley everyone is inspired to help and love senior dogs because of Kim at http://lifeatgoldenpines.blogspot.ca. Last Tuesday I worked from home. 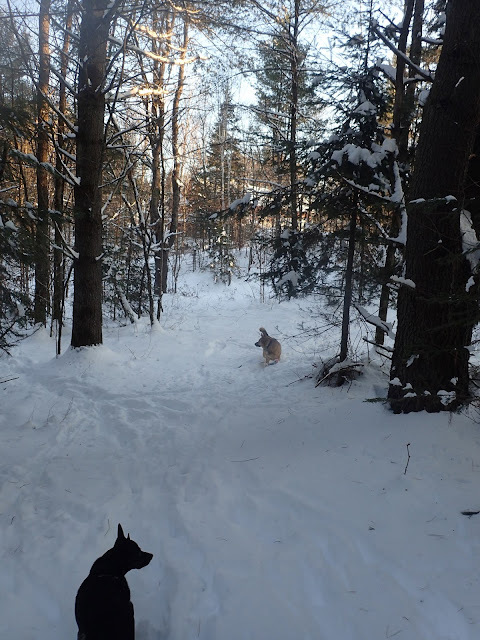 As it has been bitter cold in the morning, I decided to take the dogs out for a snowshoe over lunch. It started well enough, Phod stayed close, and came when called. We had just crested the last big hill behind our neighbours' house when suddenly, Phod was gone. When he has taken off on me before, I could always see/hear him. Hailey lost her mind but settled when we started tracking him through the bush. We came upon fresh deer beds (that is what I call the indentations the deer make when they sleep in the snow). There were at least 4. If I had to guess, the deer were sleeping and Phod found them and off they all ran. I started to follow their tracks through the bush with all these great smells and fresh poop for Hailey. I got to a spot where the bush was thick and the deer had run different ways. With Hailey leading, I couldn't figure out which way Phod went. I decided I would take Lee home and then go out and search for Phod. Lee and I trudged home. (She threw up on the way because of all the deer poop she ate too quickly). I took off my snowshoes, I put her in, and I grab my phone (in case he was found and someone called the number on his tag). I get my snowshoes back on. I open the garage door, and there was my handsome boy. He knew he was in trouble. He sulked by the front door the rest of the day. He is not going to be able to be off leash when I snowshoe now. I am going to have to learn to snowshoe with them both on leash! There is an upside to all of this adventuring, I had two very, very tired dogs! PS On Sunday the 4 of us went snowshoeing, Phod on leash. We let him off in the backyard when we got back and he took off again. He came back and we had the opportunity to do the trail again. While I appreciate the extra exercise, I don't appreciate the stress that goes with it. Hey, we don't even need to edit this picture. Phod is already sepia!!!!! As I mentioned yesterday, Hailey got to play off leash on Sunday. 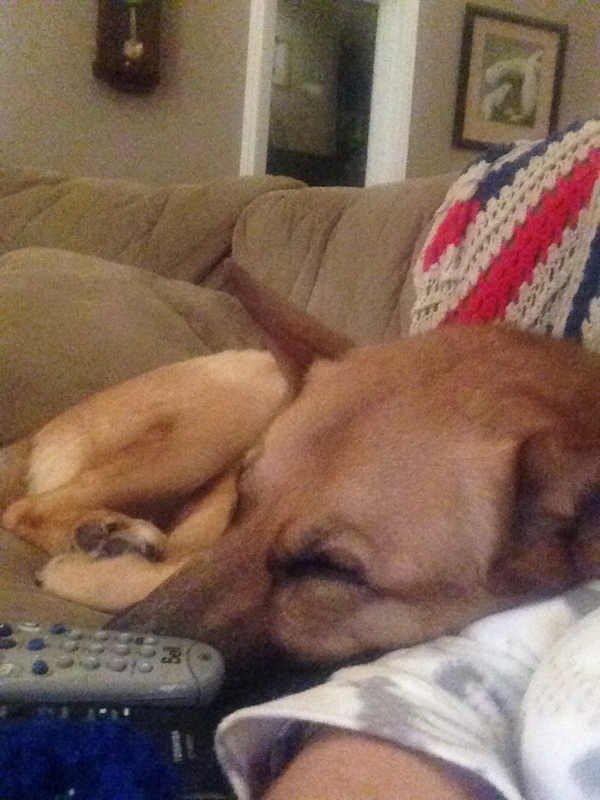 She did sneak out of the yard a bit on one of her runs. It is always hard to tell if she forgets, is just running with Phod or uses it as the opportunity to escape. We keep her leash on her so we can grab her if/when this happens. She was easily redirected back to our yard to play. I was proud of her for not going far and for coming back! If you look closely, to the right of Man, behind the bush you can see Hailey heading down the road. While Phod gets a lot of off leash time, Miss Hailey Bug does not as she has a very hard time staying in the yard. On the weekend we let the 2 have a play together in driveway, off leash. It gave Lady a chance to play more with her new camera (you will see it is a work in progress). It let the pups get exercise quickly because it was cold out! Hailey was thankful for the run! We are thankful she mostly stayed! Both the dogs love to lay by the fire. Zaphod particularly loves it. On Saturday night he was sprawled out in front of it. Suddenly I was aware of him panting and panting. He was soooooooo hot, too hot, but didn't want to move. We had to call him away. 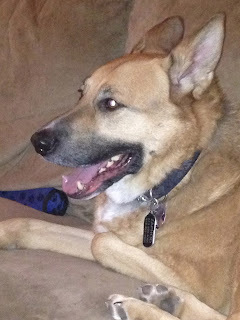 He sat and panted on the couch for half an hour before cooling down. Silly boy! We had another extra cold week. Wednesday-Friday it was too cold for enough exercise. I cleaned it up when they were distracted watching the Man snow blow! (I left the toys just took the fluff and body parts). Yesterday I wrote about the great toy box emptying last weekend. Did Hailey find what she was looking for? 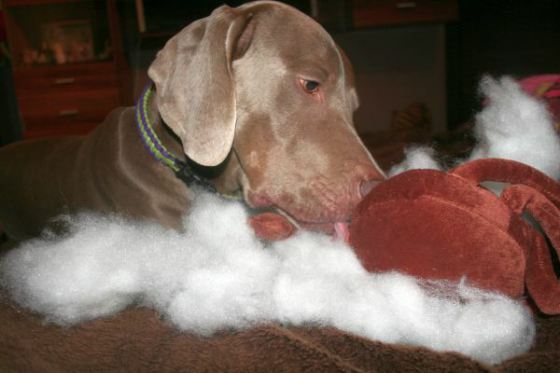 I can't say for sure, but she was very happy ripping the stuffing out of her piggy. Smiles and Toys, Toys, Everywhere! First, we are participating in Oz's When I see Sugar Smile. Sugar is having surgery and we are all sending POTP and sharing what we think and feel when we see Sugar smile. If you know Sugar at all, you know she is always smiling. When Sugar smiles, we want to smile too. Her smiles are contagious. She makes everyone around her feel happy. We wish her a speedy recovery. We have two boxes of toys (mainly plush toys). One is upstairs and one is downstairs. We don't have upstairs/downstairs toys per say, they end up where the dogs take them and when I think there is enough out, I pick a bunch up and put them in the box. On the weekend Hailey decided she needed to go through the upstairs one. She appeared to be looking for something. In the end she had the entire box empties, which I left to the next day when I picked up most (I always leave a few out). Here are some pictures of the taking out. Please forgive some of the pictures, I was playing with my new camera. Phod: "Is it ok it I take things out?" Did Hailey find what she wanted? Come back tomorrow to find out! First, we thank you all for the birthday wishes. Hailey was excited to receive this wonderful card from her French boyfriend, Easy. Thank you Easy! 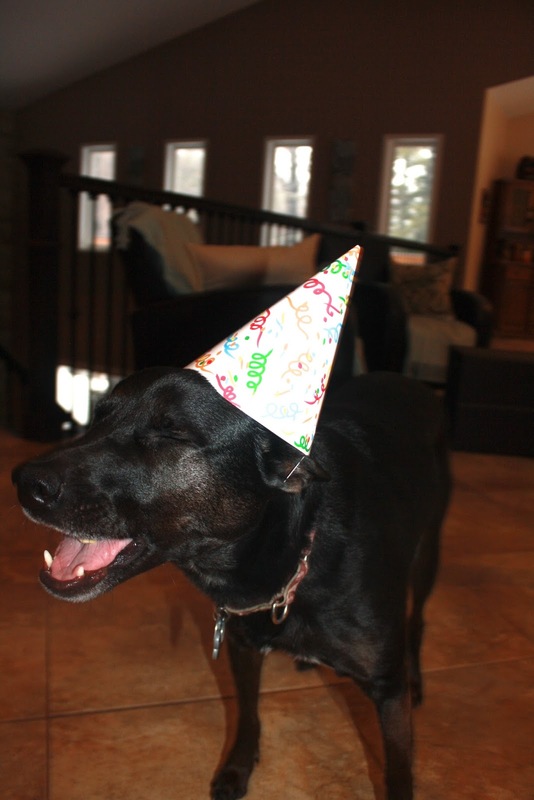 We decided we would celebrate her birthday on the weekend, when we were both home. Wednesday night is Man's night out with the guys, so he wasn't home and I had a phone consult. Don't worry, we still sang to her and gave her extra treats and snuggles on her day. I spent Sunday morning making a beef flavoured Bake-a-Bone. It has been a while since I made any type of cookie and I knew Hailey would enjoy them (and it would also be a flavour picky Phod would like). Because I made a whole batch, this is a treat Hailey and Phod can enjoy for a number of days. Much to Hailey's disappointment, she didn't get a gift. 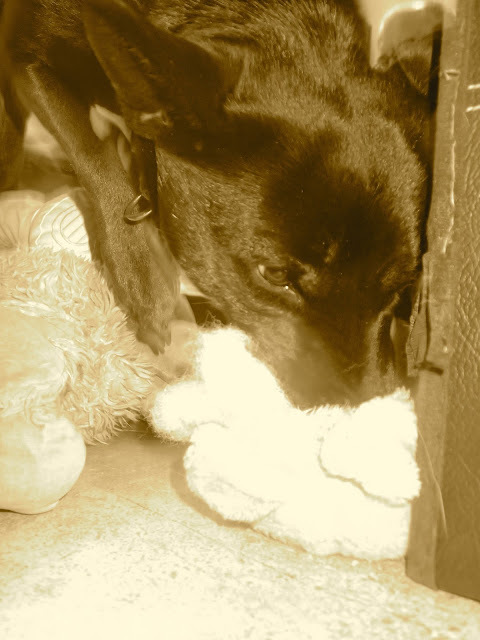 I am embracing a more mindful approach to stuff and I decided that 2 whole boxes of toys (come back tomorrow to see one of them), a drawer of puzzles and a cupboard of other treats was enough for now. (When she needs a new toy, she will get one or I will probably feel guilty next time I am in the Pet Store picking up food and cave!). 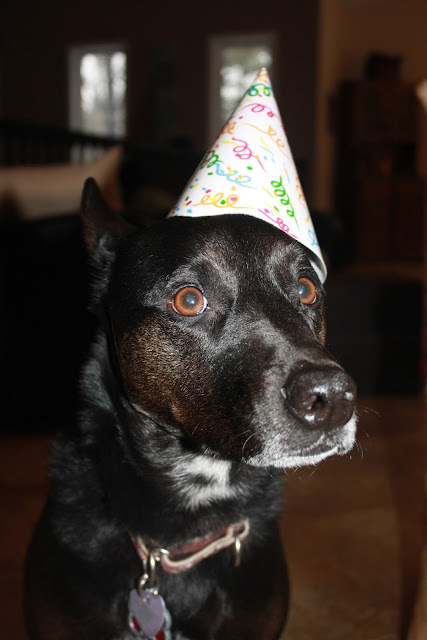 Wordless Wednesday - Happy 6th Birthday Hailey! The best way to spend a rainy day is snuggled in bed with the Man. Must rest up before my birthday tomorrow! Now if Lady would put the flashy beast away, I could get back to my beauty rest. This week's mischief winner is the weather. It is being crazy, thank you climate change. December 24th, the warmest on record at 17 C/62 F.
December 29th, seasonal cold -5 C/ 23 F and we got a foot of snow. The first real snowfall of the winter. January 4th and 5th it was bitter cold -29 C/ -20 F. We call it 3 legged dog cold. Their paws get so cold after just a few minutes that they try and walk on 2 or 3 legs. (Boots have failed and really when it is that cold we can't be out long anyway). The rest of the week more like December 29th for highs (felt balmy). January 9th and 10th had possible record warm days (5 C/41 F) and possibly record rain (calling for 30 mm/1 inch). This is going to be followed by a flash freeze (occurring as this post goes live) of -13 C/8 F, so it is going to be dangerous skating rink today. Lady is thankful for her icers for her boots, they may not be stylish, but safety first. Then tomorrow (Tuesday) we are suppose to get 5 cm/2 inches of snow. Last winter was terrible (the coldest on record with 2 months of the -29 C/-20 F) but at least it was consistent. This is just crazy! After writing this post, the power went out. This completely stresses both Lee and Phod out. We had set up our generator for the first time (we got it 2.5 years ago after 2 long power outages, 72 and 95 hours). We did't have access to everything (like we don't have a stove) but we have heat, water, the fridge, TV, internet and some lights. We were without power for 7 1/2 hours. The generator made this much more enjoyable than last time it was out in the winter. 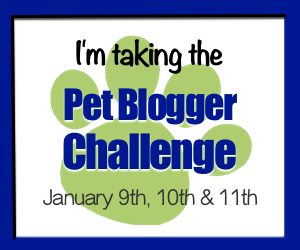 Today I am taking the Pet Blogger Challenge. Thanks to the folks at http://www.gopetfriendlyblog.com for hosting it. I have been blogging since September of 2010. 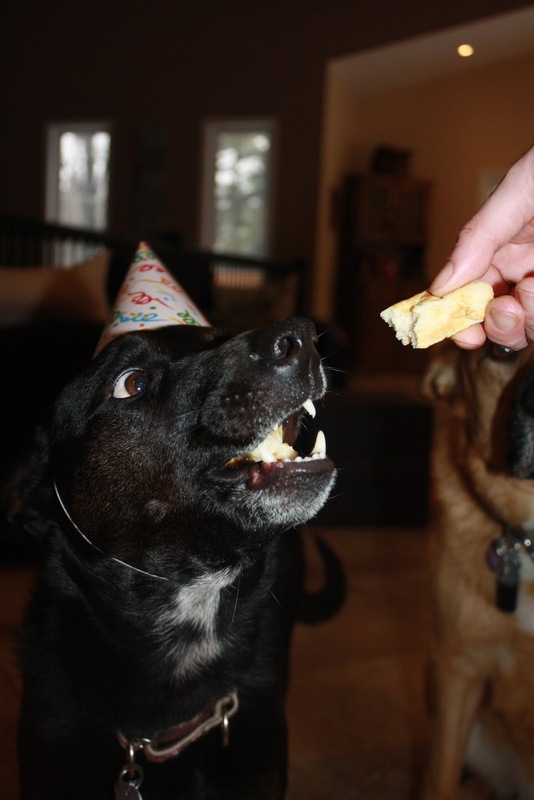 My blog started to help me cope with the overwhelming feels I had with getting a lot of dog in Hailey. 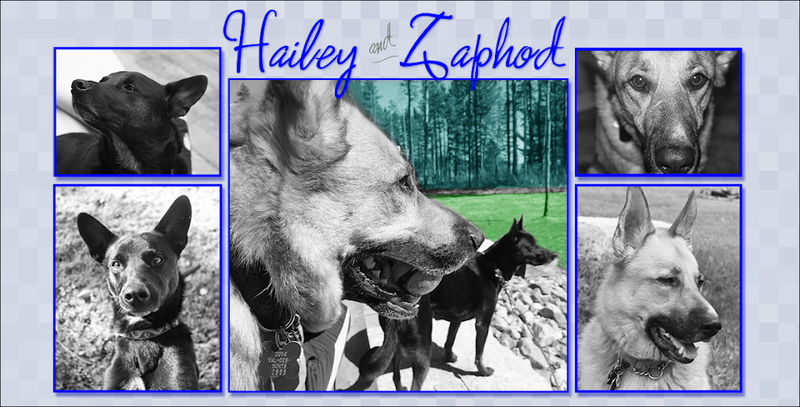 It is now the lives of my two dogs, Hailey and Zaphod and sometimes a little bit about our lives/travels. I am proud that I had 336 posts last year. Blogging regularly (and I only miss several consecutive days when traveling) is my goal, so achieving this makes me happy. Hmmmm, this is very hard. Looking back, I think the posts that featured Cinder were my favourite. I didn't start 2015 knowing for sure it would be the last year for awhile (if not ever) I would have a cat. The last post I wrote as a tribute to him can be found HERE. I was also really thrilled with the participation at my Festival of Lights that raised money for Wounded Warriors PTSD service dog program. It can be found HERE. 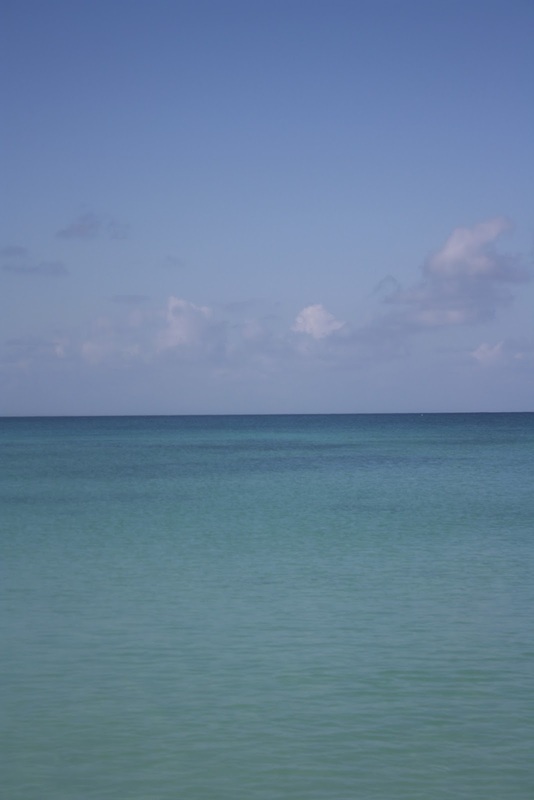 Using my blog to help others is beyond my expectations. I think by regularly reading more blogs and participating in Blogville events has helped. 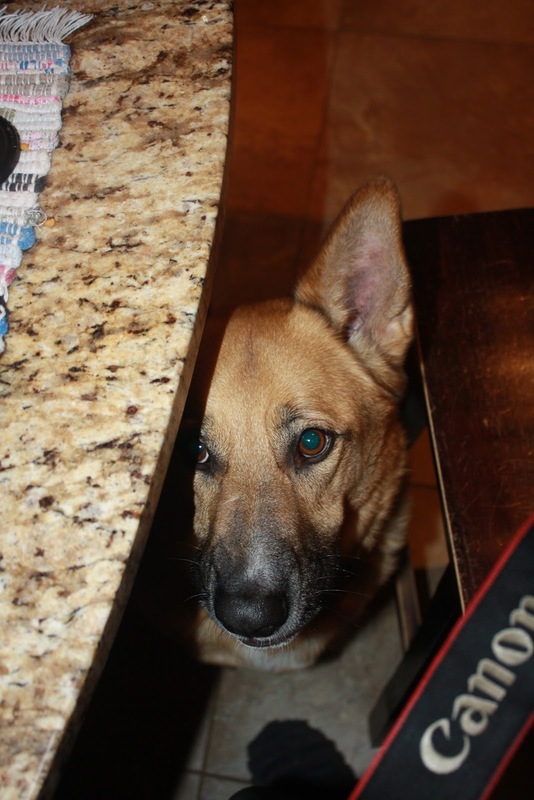 I blog because I love to write and I am a little obsessed with my dogs and it is nice to share them. I see it completely as my hobby. I am still thrilled every day that people, who are not my parents, sister or husband, care to stop by my blog. This is where I fail as a blogger. I have no idea how to check this. I can figure out month or all time, but not 2015. I honestly rarely look at the stats, I am more interested in what people are saying. Wow, this is a really hard question. 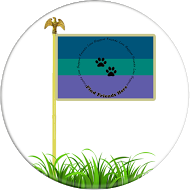 I have about 100 pet blogs I try and visit as regularly as possible. I love them all for different reasons. If I was going to pick one to share with others, I would pick The Dog Who Doesn't Fetch. It is also a Canadian blog. The pictures are beautiful. I love the "voices" of the dogs. Ojo and my Hailey have a lot in common. (We have decided they are "cousins"). Any improvements in these are inspired by other bloggers. Write it for yourself first and foremost. This will keep you grounded and honest and will attract other people. All my favourite blogs are honest if nothing else! I think it is about time for a blog make over. The graphic design is outside my wheel-house and interest really. I will have to figure that out. 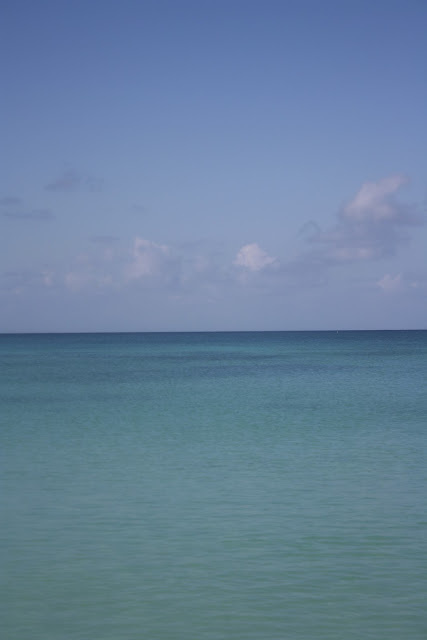 I always want to improve my photography, so that is something I may tackle. An even bigger goal is to meet some fellow bloggers at the Blogville Awesome Retreat. The idea of it is exciting and scary at the same time! I think the "design" areas are where I am lacking - for example - creating headers, badges, changing the look, and fun photo editing. If there are idiot proof resources for that, I would love to have them. This picture was taken on Hailey's first birthday. She had been with us 4 months when this was taken. We will be celebrating her 6th birthday on Wednesday the 13th. 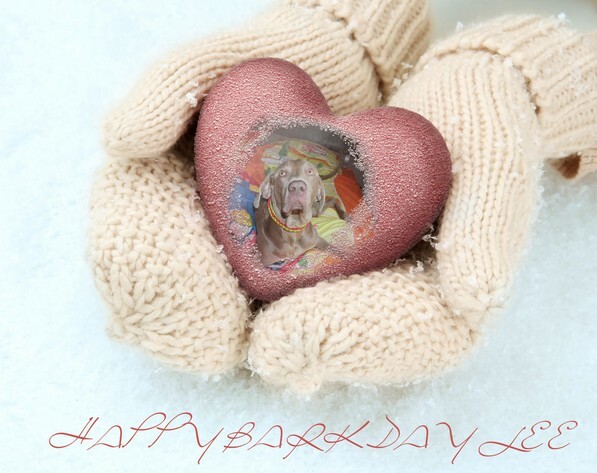 We hope you can all stop by and wish her a very happy day! I am not a winter lover. Even as a 6th or so generation North American, I do not enjoy the cold and snow. The older I get, the less I like it. However, after my time in Iceland, and reading research on how happy Norwegians are in the winter, I have decided to embrace it. I decided I needed a winter activity, and I picked snowshoeing. For the last week or so, I have been a snowshoer. So far, it is great. We are blessed to have access to a number of acres of woods in the hills behind our house, so we don't have to go anywhere. Hailey has only managed to pull me over once (the first time we tried it). For the most part, Phod can run free (although he did run off on Wednesday). As long as the weather isn't too cold, I can see doing this several times a week. These pictures are the first taken with our new camera (not replacing our fancy Cannon, but for doing things it can't, like be dropped in the snow - which is the first thing I did - and going underwater), the Olympus Tough-4. I will be able to play with it more and get better pictures when the Man goes with us. It is hard to do with one hand. Here is some of the winter beautiful! Phod loves to run along the trail or bounce in the bush to make new trails. In places the snow is over Hailey's armpits, she has to swim! It is great exercise for her. Almost home. Can you make out our house? 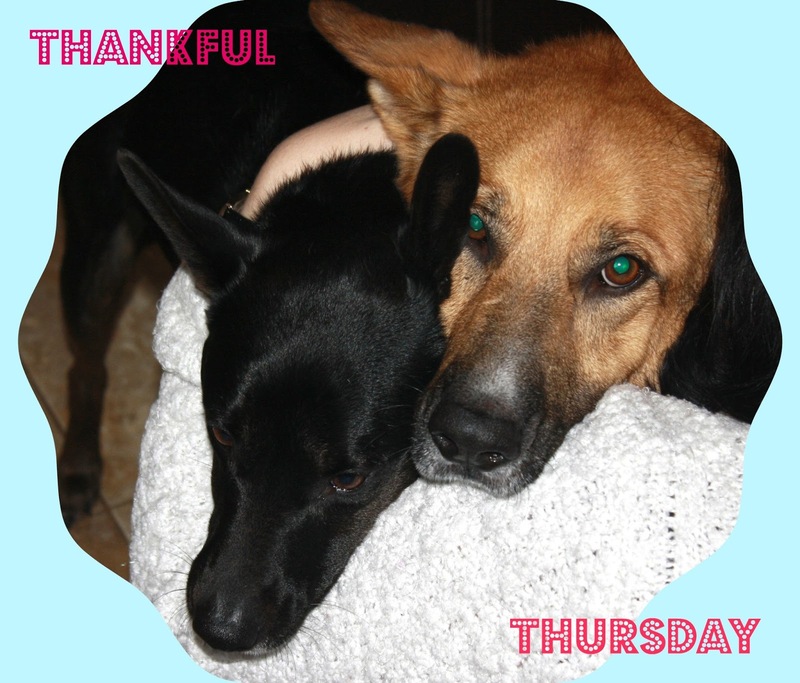 Thankful Thursday - Thanks Daisy! Welcome to a new feature on our blog, thankful Thursday. As some of you may know, Thursday is my least favourite day. To quote the great Douglas Adam's in Hitchhiker's Guide to the Galaxy "I never could get the hang of Thursdays." Instead of dreading it, I am going to celebrate it with this new feature. Feel free to join us any week you want! (I know it can be hard to remember all the events). This week we are thankful that the temperature has improved. Monday and Tuesday were bitter cold with temperatures around -29 C/-20 F in the morning, so no walks. Wednesday it was only -13 C/ 9 F, so we were able to have a nice walk and go snowshoeing (more about that tomorrow). The weather looks "warmer" for the rest of the week and into next week, thank goodness. We are also thankful that the mailman finally brought a very special gift from California! It took over 2 weeks to get here, but was well worth the wait. It was a special gift for Hailey from Daisy. 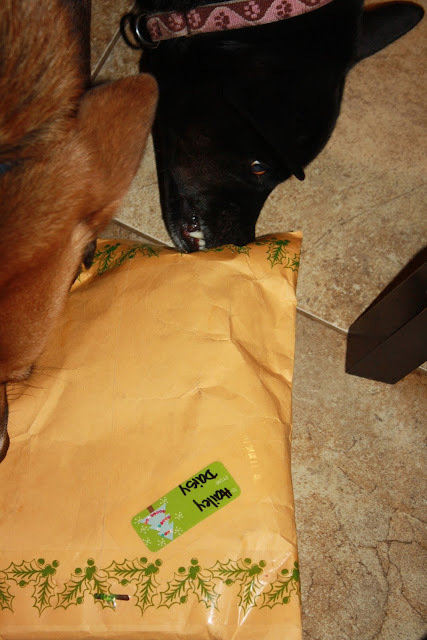 Hailey tried really hard to open it! In the end she needed a little help. Inside was 4 nicely wrapped presents. Phod joined in the unwrapping! Inside was a delicious reindeer cookie, a chewy we haven't gotten yet, a gingerbread man, and snowballs! Phod patiently waiting for Lady to take the tags of Gingy. 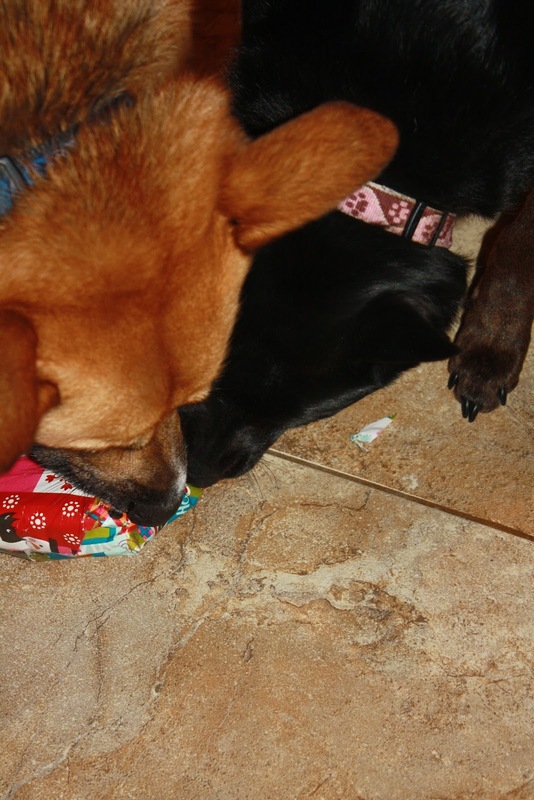 I gave the toy to Hailey, but Phod wouldn't be left out and joined in. It is a mirage, but so far Gingy is in one piece! Thank you Daisy for your very sweet gifts, we love them!